That moderate drinking our traditional drink rakija can be quite healthy, showed numerous scientific researches recently. They finally proved that thing which rakija fans long knew or at least wanted to hear publicly: that moderate drinking of rakija can be considered a natural drug that lowers cholesterol, reduces the possibility of suffering from cardiovascular disease, heart attack, heart failure, increased blood pressure and stroke. And of course, despite the good brandy produced in the traditional way, it is really stupid to drink, for example, rum produced from sugar cane and genetically modified or certain types of vodka which, as experts say, are produced of what our brandy producers throw away as waste. Rakija is even recommended from doctors in heart postoperative diet: a shot of brandy in the morning and one at night. Rakija is good because it thins blood, and it is known that until the appearance of the first painkillers (ie. Sedatives and analgesics consumption in pills form appeared only at the beginning of the 20th century) brandy was used instead. There are testimonies that in the time of cholera, people survived with drinking stronger brandy and eating garlic. Perhaps that is why there is almost no house in the country without a bottle of brandy at home. One to two glasses of brandy a day are healthy for our body, whether it is a grape brandy, apple, plum or some other type. If we observe these doses, homemade brandy can be a powerful medicine. It prevents heart disease and stroke, improves circulation, soothes inflammation in the body and improves digestion. People who know to consume brandy wisely, can significantly increase their life expectancy. Except in our country, rakija is considered a national drink in Serbia, Croatia, Bosnia, Montenegro, Albania, Bulgaria and Turkey. Generally, it can be produced from any fruit with sugar. 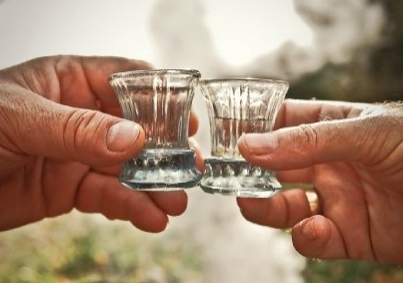 The tradition of producing rakija in the Balkans is from the XIV century. At the beginning it was made only from grapes or wine, and later from other fruits, plums, apricots, apples, peaches, cherries, blackberries, pears, figs and quince. Also popular is the black brandy that is made from fresh nuts. Here rakija is mostly made of grapes, while Serbia and Montenegro are famous in making shlivka made of black plums. In Bulgaria and Croatia brandy can be made from grapes, but also from plums. Slovenians make brandy from viljamovka pear, but with herbs, famous in the western world as a digestive liqueur with high amount of gradients. Japanese and Chinese make rice rakija. However, the one that is the goal of our research is the grape brandy...to be continued.